Male mallards are decked out in bright plumage from fall to early summer. They have an iridescent green head and white stripe around the neck, as well as a yellow bill and orange feet. It’s early February, cold and snowy, but creatures are beginning to stir, bringing hints of spring. Winter doesn’t seem so long and dreary when we notice these changes in nature, such mallards returning to small areas of open water this month. Mallards (Anas platyrhynchos) are the wild ducks that we’re most likely to see around Westborough. They’re common and numerous, and they seem less wary of humans than the many other wild ducks that you might spot, usually way out in the middle of a pond. Mallards are also relatively tolerant of cold. Our ponds remain iced over for much of the winter. Just ask the people you see ice fishing. But as the days get longer, running water is less likely to freeze, so our streams and rivers can be good places to find returning mallards. Since late January, for instance, a flock of 50 or more mallards has been enjoying the stream that runs alongside the high school’s lower driveway, right in town. They also rest on the stream bank, taking shelter under some evergreen trees, and perhaps benefiting from seeds spilled from local birdfeeders. They show up there every year in February. If you hear the kind of quacking we usually associate with ducks, it’s a female mallard. Males make different sounds. Like other wild ducks, mallards can be fun to watch in fall and winter, when male mallards are brightly colored. Female mallards are dull-colored and well camouflaged year-round, and mallard males look very much like them for a few brief months in mid- to late summer. Not surprisingly, the reason for the male’s bright plumage is courtship. Mallards tend to form new pairs every year, and courting goes on from September through March. Most are already paired by the time they reach the area where they will breed in the spring. Typically the female returns to the area where she nested successfully the year before, and this year’s new male follows her there. The male usually leaves once the female gets busy incubating eggs. Female mallards are camouflaged in brown feathers year-round. Both females and males have an iridescent blue patch edged with white on the wings. It is partly hidden in this photo. Males look very similar to females in late summer, but one difference is the color of their bills. Females generally have orange bills, like this one does, while males have olive bills. You can often spot pairs as they swim together in a flock of mallards. On open water, male and female will sometimes face each other and pump their heads up and down, sometimes as a prelude to mating. Mallards also spend time on land. They walk and run well. One reason is that their legs are placed in the middle of their body, allowing them to balance well on land. Mallards often sleep on land. Speaking of sleep, you might notice a mallard sleeping with one eye open. What’s going on? Like other ducks, mallards have a special ability when it comes to sleeping. One half of their brain can sleep while the other half remains awake. 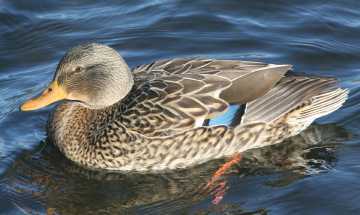 When a mallard sleeps with one eye open, the half of its brain in the opposite side of its head is awake. This doesn’t sound very restful to us, since we’re used to sleeping or staying awake with both halves of our brain. But it’s handy for ducks to sleep with one eye open so they can keep watch for predators. The ducks on the outer edges of a group, such as the flock on the stream bank near the high school, are more likely to sleep with one eye open than those in the middle. But even when sleeping ducks close both eyes, they open them every few seconds to check for predators. Mallards are “dabbling ducks,” as you’ll see when you watch them feeding on open water. They feed at the surface by skimming the water with their bills, sticking their heads and necks under the water, or by tipping tail-up with head down in water. They are largely vegetarian for much of the year. But mallards also eat insects, insect larvae, snails, freshwater shrimp, and earthworms – especially in the breeding season, when females need protein to produce eggs and ducklings need protein to grow. Mallards’ tongues and bills are well suited for dabbling. Their tongues are different from ours, with comb-like fringes on the sides for filtering food from the water. Likewise, their bills have strainer-like edges that let water out but keep food in. Their bills also have a nail on the end that helps them grab and pull up water plants. If you see a group of ducks from far away, you can tell which ones might be mallards because they’re dabbling, rather than diving as certain other ducks do. But that’s not a sure-fire way to tell, since not all dabbling ducks are mallards, and some mallards do dive. Mallards nest on land, usually close to the water, starting in April. Only the female builds the nest and lays 10 –13 eggs, one a day. The nests are well camouflaged, so it’s possible to step on one by accident if you walk along a pond’s shoreline. We can look forward to seeing mallard females and their ducklings on Mill Pond, Lake Chauncy, and the Reservoir in June and July. Ducklings hatch after a month-long incubation. They’re well developed – ready to walk, swim, and feed themselves. They are covered with dense down that traps air, insulating them and helping them to float. After only one day in the nest, they follow their mother out onto the water. About two months later, they can fly and leave their mother. 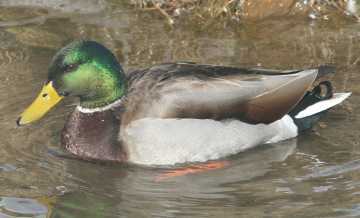 Mallards need to nest near fresh water, even though adults can spend time on salt water. The reason is that adults have salt glands (over their eyes) that rid their bodies of excess salt, but ducklings don’t. Salt water can be fatal to mallard ducklings. Mallards are the most heavily hunted duck in the U.S. Almost all domesticated ducks have descended from mallards, which themselves were domesticated in Far East nearly 3,000 years ago. The Massachusetts duck-hunting season includes various periods between October and early January. No hunting is allowed in Westborough except by permission of the landowner.